This image file containing a JPEG and PNG version of the image, each at 300dpi resolution. Digital files can be re sized, rotated or flipped. Use the PNG transparent background version to layer digital images. Believe it or not digital images are wonderful and super easy to work with, don't get me wrong I still love touching and feeling the stamp and ink. But it is so awesome to be able to re size and play with digital images. 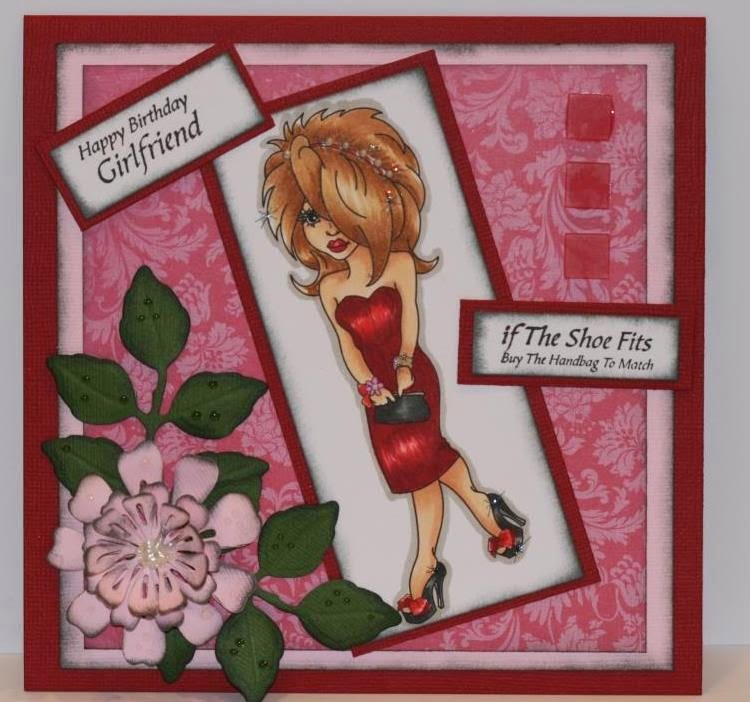 So here is my creation, made as a girlfriend birthday card. Who doesn't like a little retail therapy and maybe lunch or dinner on their birthday. I absolutely love to get dressed up, throw on a awesome pair of high heels and go out. I have a big weakness for a great pair of heels and look for any reason to wear some. So this image called to me, with heels and a matching dress, it fits that theme wonderfully. A bit closer look at Kate colored with copic markers. I added some liquid pearl to her headband and some sparkle to make her pop a bit.